The history of the Menorah, is something that I'm going to try to simplify, although if you are truly interested, I would suggest that you really research the history of the Menorah because it is a story that is in all actuality very interesting and meaningful. And the following paragraphs that I will summarize for you, will be barely scratch the surface of the true story of the Jewish Menorah. Hanukkah is an eight night celebration, which is sometimes called the Festival of Lights, in which the Jewish people celebrate and remember the triumph of the Hebrews over religious persecution and when they were able to escape the oppression of Antiochus, a Syrian king. 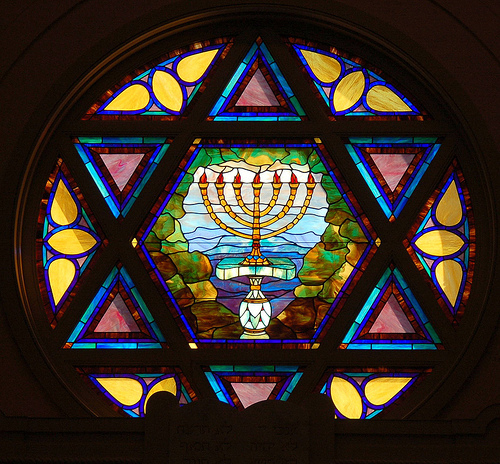 Every night of Hanukkah, a candle is lit on the Menorah, or Hanukiyah. Now, the tradition of lighting the Menorah, has its roots in about 167 B.C., when Antiochus IV, the Syrian king, tried to outlaw the Jewish religious practices, wanting the Jews to adopt Greek rituals. Antiochus has his men take over the Jewish Holy Temple in Jerusalem; they looted the temple and put an idol of a Greek god in place. Well, the Hasmoneans, which was a Jewish family led by Mattityahu and his five sons, took stand and refused to violate their own religion by practicing Greek rituals and praying to the Greek gods. Mattityaho and his sons attacked the Greek soldiers when they arrived in Modiin, which was near Jerusalem. This one family began the Jewish rebellion, and Mattityahu and his sons became known as the Maccabees, which means 'men who are as strong as hammers." Well, Mattityahu's son Judah, fought a pretty big group of Greek soldiers, and in 165 B.C., the Maccabees were successful. The Maccabees were able to reclaim the Holy Temple on the 25th of Kislev, which is the Hebrew month of December. The Maccabees rededicated the temple, "Hanukkah," which means dedication, and while the Jewish army was at the Temple, they were unable to find enough oil to light the menorah, which was commonly used in service. The Maccabees found one bottle of oil, which was typically enough to light the menorah for only one night, but upon every one's surprise, the one bottle of oil lasted for eight nights, which allowed the people enough time to produce more oil. So, now as for tradition, Hanukkah celebrates the miracle and the triumph over religious oppression. During Hanukkah, Jews light one candle for the eight nights of Hanukkah to celebrate the rededication of the Holy Temply and the miracle of the one bottle of oil lasting for eight days. You want to set a time towards the evening after the sun has gone down to light your Menorah and when all members of the house are available and present to light the Menorah. When lighting the Menorah, use the ninth candle- the shamash- to light the other eight candles individually. You never want to use one of the eight candles, as they are to be looked at and seen only. You want to make sure to leave the candle(s) lit for at least 30 minutes after nightfall. But, on Friday, you want to light the candles before the sun goes down. On the first night of Hanukkah, you light the candle on the far right side, facing the Menorah, and for each night thereafter, you will light the next candle. When lighting the candles, you will want to recite the following blessings. "Blessed are You, Lord our God, King of the universe, who has sanctified us by His commandments, and has commanded us to kindle the lights of Hanukkah." "Blessed are you, Lord our God, King of the universe, who wrought miracles for our fathers in days of old, at this season." "Blessed are You, Lord our God, King of the universe, who has kept us alive, and has preserved us, and enabled us to reach this time." The third blessing, is typically only recited on the first night. Thank you for the religious lesson on the history of the Menorah. Next tell us about the dreidel. I believe it is a toy?